From 1931 until 1996, Bush Stadium in Indianapolis, Indiana served as the home of the Indianapolis Indians; a AAA minor league baseball team currently affiliated with Major League Baseball's Pittsburgh Pirates. The Art Deco stadium complete with it's ivy covered walls saw the Indians play as the farm team for not only the Pirates, but the Cleveland Indians, Milwaukee Brewers, Montreal Expos (Now the Washington Nationals), Chicago White Sox, Philadelphia Phillies, Boston Braves (Now the Atlanta Braves) and even the Cincinnati Reds. Famous Reds such as Ken Griffey Sr., George Foster, Dave Concepcion as well as both Brett and Aaron Boone all played games in Bush Stadium at some point in their careers with the Reds organization. 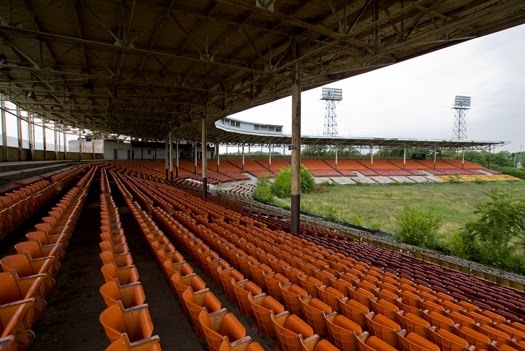 - An active Bush Stadium in the early 90's contrasted with the abandoned Bush Stadium of 2009. 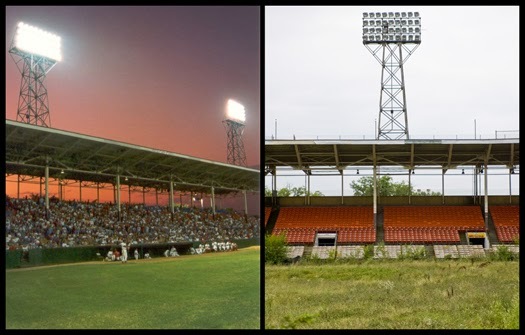 (Left Photo credit: MinorLeagueBallparks.com). I once took a history class entitled: "The History of American Baseball: 1930 - Present." The professor of the class had a saying: "Baseball mimics culture," referring to how trends in popular culture and trends in America's favorite past time coincided with each other. I didn't fare too well in the course, but that quote really sparked a deeper interest in baseball for me. Bush Stadium had not only seen baseball change, but so many aspects of our culture change. From a depression era ballpark when baseball was at the height of it's popularity to the increasing commercialization of minor league baseball in the mid 90's, Bush Stadium had been there. The Indians organization of the International League vacated the stadium in 1996 for a more modern facility closer to downtown. 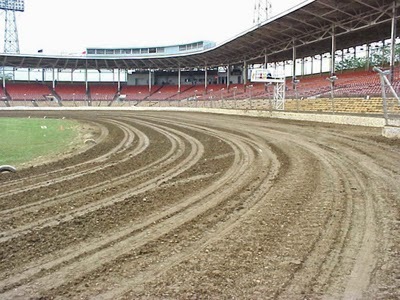 In 1997 the stadium was purchased and transformed into the 16th Street Speedway, a quarter midget auto raceway. It's signature ivy that had once adorned the walls was ripped out and the traditional baseball diamond was replaced by a dirt track and steel fence. - Bush Stadium during it's "16th St. Speedway" days. Photo credit: Steve Hardin. 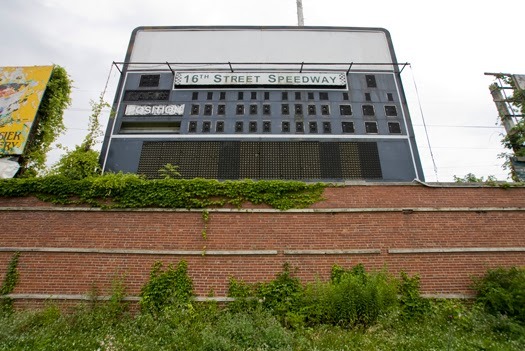 After two seasons, the 16th St. Speedway closed and the stadium eventually came under the ownership of the Indianapolis Parks and Recreation Department. Today it sits idle, awaiting a future. Paul Smith, of Indy Parks and Recreation was kind enough to allow me access to photograph the stadium after I contacted him. This was a great opportunity to not only see where players I remember watching growing up as a kid and members of the Big Red Machine passed through on their way to Cincinnati, but to visit a stadium that had been witness to so much history. After a four hour drive, my dad and I met up with my cousin Jeff and my good friend Jesse Marchbanks, a current Indianapolis resident who had visited the stadium as a kid. As we entered into the now overgrown outfield, the saying "They don't build em like they used to" came to mind. 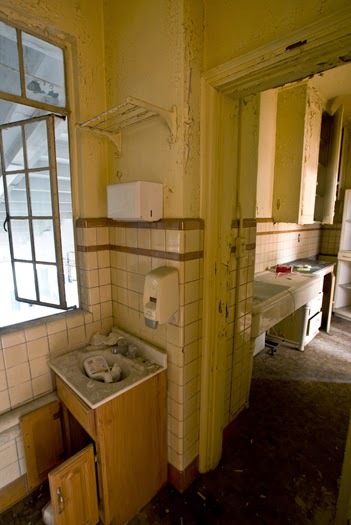 They certainly don't make stadiums with this much character anymore. 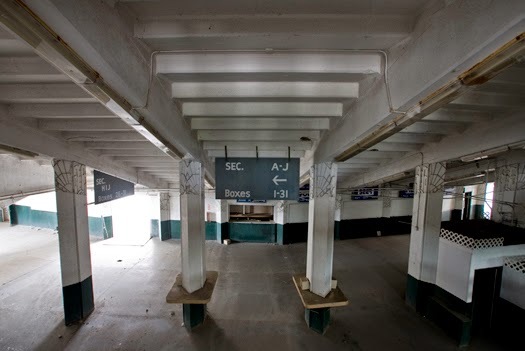 We ducked under the third base stands and into the main concourse. Since their inception, the Indianapolis Indians have been a AAA team, meaning the highest form of minor league baseball just below Major League Baseball. While the stadium certainly did not have the seating capacity of today's ballparks, it did boast the ability to accommodate and estimated 12,100 fans. We took the first left, up a concrete ramp into a section of stands to get our first view of the ballpark's grandstands, just as eager Indians fans had been doing for years up until mid-season 1996. 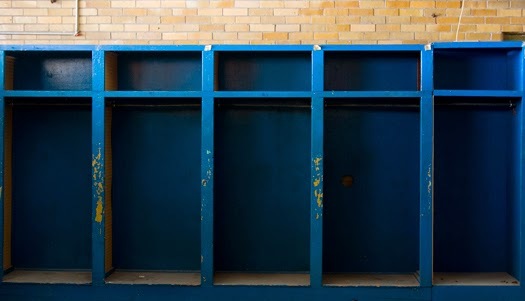 Although it originally featured wooden seats, the Indians organization had retrofitted the stadium with plastic ones in an effort to try and update the facility at one point. Our group made a lap around the stands, taking in the view. An unused baseball stadium is certainly a sad sight and seeing Bush Stadium in it's current condition reminded me of Detroit's Tiger Stadium. 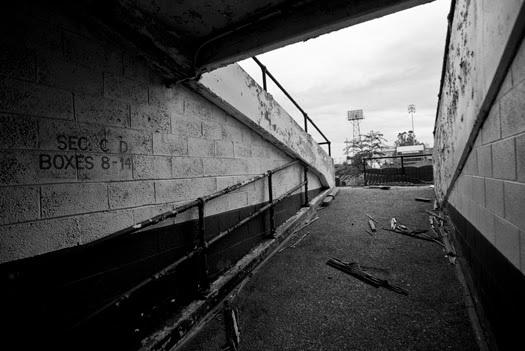 One of the inspirations for creating Queen City Discovery was a website entitled "Wide Open Detroit" and their exploration of Tiger Stadium after it had been closed down (The website now seems to have gone offline). 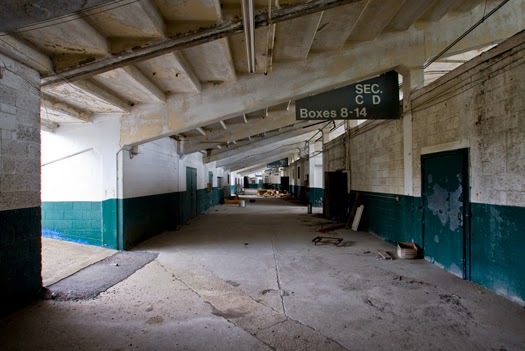 As I walked through the stands of Bush Stadium, I was reminded of Wide Open Detroit's photo essay. Classic Tiger Stadium is now demolished. 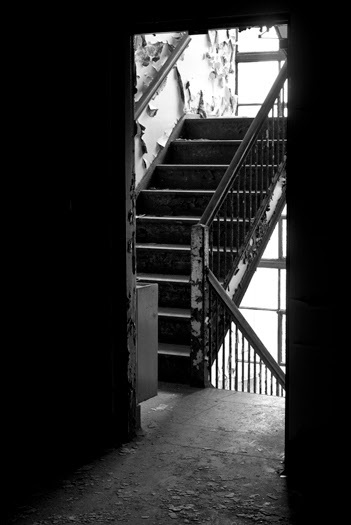 Through a door in the stadium's upper concourse we found our way to the roof. The stadium had been retrofitted with a press box and small "luxury" suites at some point in it's life, mid 70's to late 80's would be my guess judging by the old air conditioning units and siding. 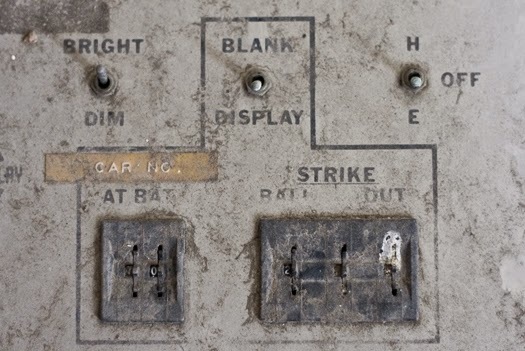 In the press box, the controls for the scoreboard still remained. The controls and scoreboard had been slightly altered for auto racing. Traversing the roof, we walked beneath the stadium's old lighting structures which were very similar to the ones at Wrigley Field in Chicago and that were once found at Crosley Field in Cincinnati. 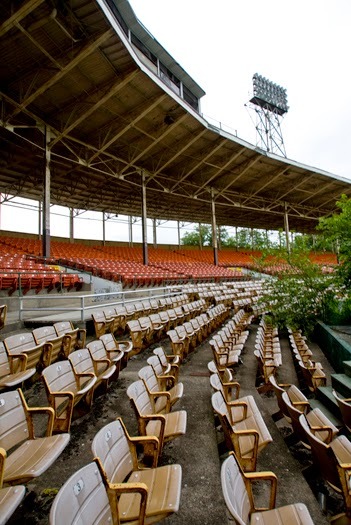 Bush had been used as a stand in for Crosley Field during the filming of the 1987 movie "Eight Men Out." From the roof we headed back down to the main stands and towards the building's executive offices. Inside the compartments was a mirror and a rope pulley. When the admission windows were accumulating enough money or needed more change, bags of money could be fastened to the ropes and lowered down or raised up straight into the team's executive offices. 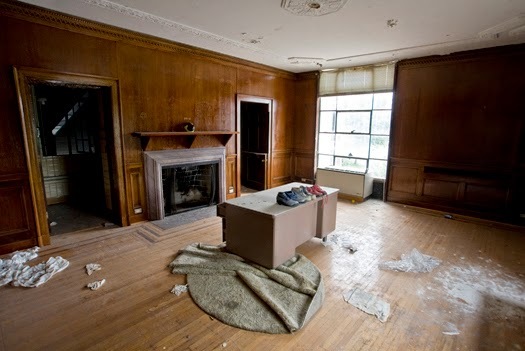 At the very end of the executive offices was the owner's office. 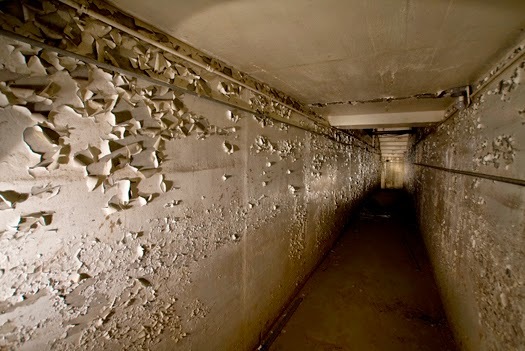 It's a cliche figure of speech, but "if only these walls could talk" it's interesting to think of all the scouting, trading and negotiating that went on here between 1931 and 1996. 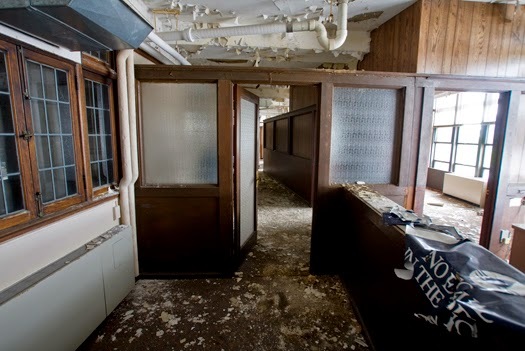 The owner's office came complete with it's own fireplace and bath room which overlooked the stadium concourse. It even had a set of stairs leading to a personal garage on the lower level for the owner's vehicle. 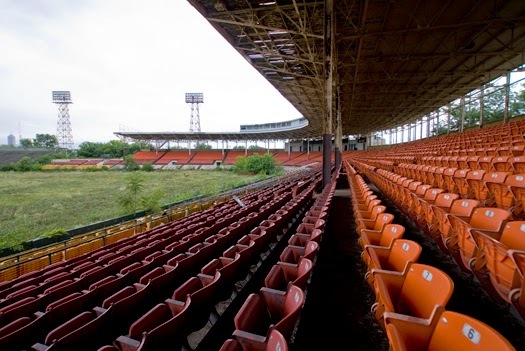 When the stadium was purchased and the speedway put in, Bush lost a lot of it's character and charm that it had been known for. The speedway operators tore the signature ivy off the walls and cut off the underground paths which lead from the locker rooms to the dugouts. 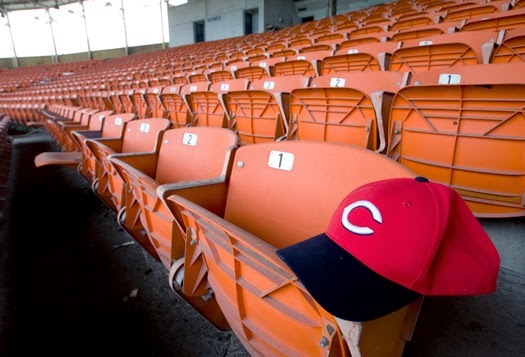 Despite the changes made by the speedway people, many artifacts of the stadium's baseball history still remained. 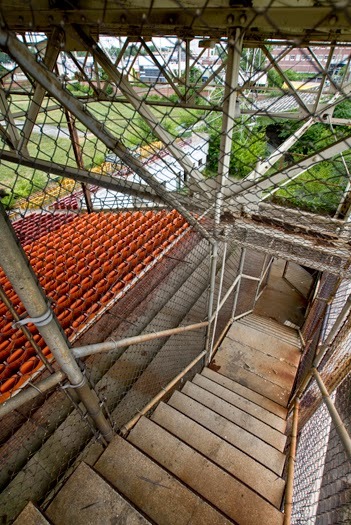 Out in the stadium's right field, wooden bleachers that once served as "cheap seats" have begun to rot away. In the outfield, ivy that had once been ripped out by the speedway operators, has begun to grow back. 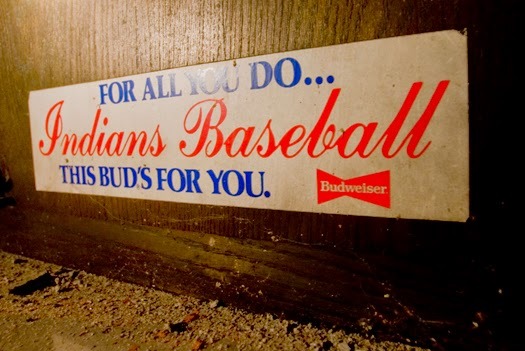 As with many AAA and major league teams; the Indians moved to a newer, more commercialized facility, more evidence of how "Baseball mimics culture." Today only a handful of parks in the various levels of baseball can hold a candle to the charm and history of a place like Bush Stadium. From time's when it was fashionable to don a fedora and suit to catch a ball game to the steroid scandals and home run chases of recent baseball history, Bush Stadium has seen it all. One can only hope the good folks at Indy Parks in the future will somehow develop a use for the site in some capacity. 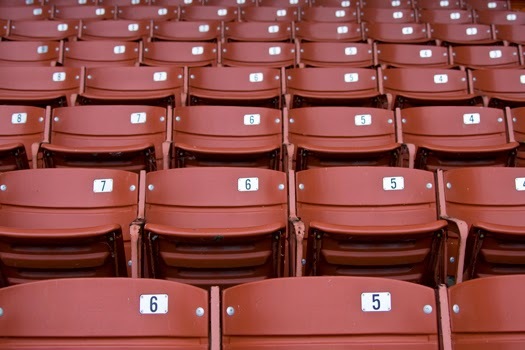 "After a while as we were standing in the grand stands I started to look around and remember the area's of were I had sat at during many of games I attended there as a young boy and through Junior High. I even got so caught up in my memories that I shared a few endearing moments of how my dad (now deceased) knew a catcher one year and and when we went to a game the catcher came over signed a few autographs for some lower seated fans then looked up to us and said "Hello Jim good to see you, thanks for coming out" then throwing a baseball to my dad and said "give that to your boy will ya" I remember feeling frozen in my seat and thinking Wow how great is my dad knowing the catcher like that. The baseball was signed and it sat in a special baseball cradle on a shelf in my room until I moved from home." Much thanks and grattitude to Paul Smith of Indy Parks for his help and assistance in this photo essay! EDIT: Since the posting of this article in 2009, Bush Stadium has undergone some changes. After being used as a car storage lot in the government's "Cash for Clunkers" program, the stadium was eventually renovated by a private company. The building has been saved and converted into luxury apartments. 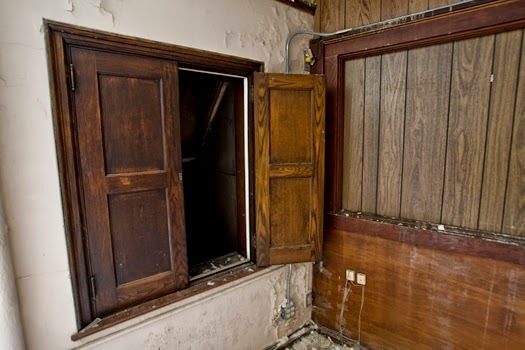 Some of the photos from this article were used in a documentary about the renovation process. You can read more about that and see the full documentary here. excellent, excellent work! 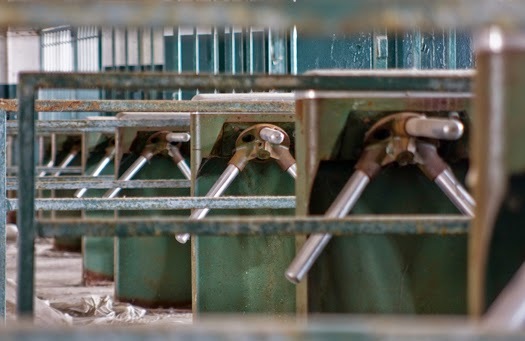 esp like the shot of the turnstyles. Great pictures! I used to go there as a kid to watch games... love the stadium. The big problem with this stadium is how to use it. As you may have noticed it sits on the West side of downtown some distance from the city core. While there has been serious neighborhood revitilization on the east,south and north dides of the downtown core, little has happened on the west side. It is kind of a "no mans' land , obviously go further west and you are at the highly sucessfull Indianapolis Speedway. At present there isn't much around it and that is part of the problem. It is a shame because it is a fantastic structure and should be used, unfortunately no one has come up with a decent proposal. Thanks alot for your excellent review of the old Bush Stadium. I worked there for 6 years during the mid to late 80's. Even worked in the old manual scoreboard in LF for 4 of those years. Priceless memories. One of my most special places. 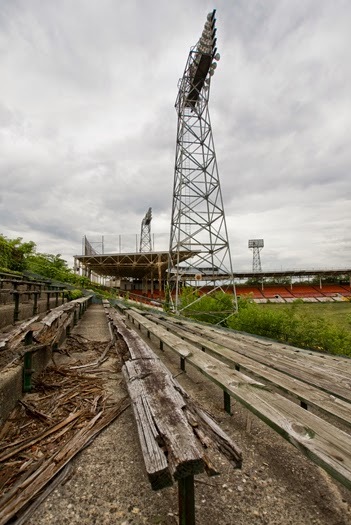 Breaks my heart to see the old stadium in such a condition. who knows what we could do? minor league hall of fame, little league field, urban park/farm, community gathering place, mass transit hub, reception/music hall, hotel, restaraunt, green technology labs & educational center...the possibilities are endless. And we must set our goals to the ILBI's LIVING CITY CHALLENGE - net zero energy, water, waste. the key is to get everyone thinking, challenging, exploring, inspiring, uniting toward a common goal...local sustainable landmark foundation, the true "Crossroads of Indianapolis"
Thanks for this post! Loved the pictures. The building is now being converted into apartments. They'll be called Baseball Lofts, I believe, and will open this summer. I drive by it frequently and am glad to see most of the structure has been preserved faithfully. In October 2011, I attended the press conference to announce the project, and my parents and I walked around for quite a while exploring the structure. It's sad to see it change, but good to know it will be preserved and put to good use. I should add, too, that I attended many games there as a child, and remember my sister getting a ball from a player too! We followed that player, Tim Belk, for several seasons afterward. We attended the final game at the stadium in 1996 when I was about 10. Victory Field is very nice, but Bush Stadium had the authentic character that only an old structure has. And that fabulous art deco style! Coming from a racer, and someone who is very interested in the history of racing. This place is just amazing. Although now I know that it being turned into apartments. I do have a soft spot for this place. Wish I could have seen it in action.